Latitude is the measure of how far north or south one is from the equator. This angular measurement is given in degrees, minutes (1/60th of a degree), and seconds (1/60th of a minute) of arc. Read More that propelled the ship eastward. 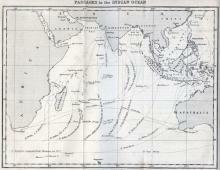 Along the way to the Far East, ships could stop in the Pacific Northwest for furs; Mauritius, Bombay, and Calcutta for cotton; Sumatra for pepper, Batavia for sugar and coffee; and various European ports.